Mold refers to the more than 300,000 species of fungi that can be found both indoors and outdoors. While mold grows best in warm, damp, and humid conditions, their spores can survive harsh environmental situations, such as dry conditions, and then bloom again when conditions are ripe. Though mold growth can occur year-round, it is encouraged by warm and humid conditions such as those that occur in the Spring here in Wisconsin. Outdoor mold can be found in shady, damp areas or places where leaves or other vegetation are decomposing. Indoor mold can be found where humidity levels are high, such as basements or showers. If you can see or smell a mold problem, testing or sampling is typically not necessary. It is more important to identify and remediate the moisture source and clean up the mold, than to spend the time and money on testing. In addition, there are no agreed-upon, health-based standards for human exposure to mold or mold spores. Small areas of mold growth on nonporous surfaces can usually be cleaned by the removal of the gross mold buildup, followed by application of a simple bleach solution (1 cup bleach in 1 gallon water). The affected area(s) should be allowed to dry thoroughly. Extensive cleanup of large areas may require the use of a mold/water cleanup service and the removal of mold-contaminated surfaces (including drywall, carpeting, or wood flooring). Keep humidity levels as low as you can—no higher than 50%--all day long. An air conditioner or dehumidifier will help keep the level low. Humidity levels change over the course of a day with changes in the moisture in the air and the air temperature, so you will need to check the humidity levels more than once a day. If you are renting and feel your landlord is not being responsive to your concerns, you can call the Tenants’ Rights and Responsibilities at 608-224-4976 or Toll-free in WI at 800-422-7128. Missed the highlights? Click here to view previous highlights. We have learned of recent cases where people, posing as health inspectors, obtain financial information or force payment of unpaid fees. In some cases, the impostor has cited inspection reports. As always, it is important to verify that a health inspector is who they claim to be by checking their ID and obtaining a business card. As a reminder, we will not ask for financial information, nor will we accept payment by credit or debit card in person or over the phone. If you encounter potentially fraudulent activity by an individual claiming to work for the North Shore Health Department or North Shore Environmental Health Consortium, or if you would like to verify identity of an inspector, please call us at 414-371-2980. Extreme cold can cause frozen pipes. Because water expands as it freezes, this can cause burst pipes. Learn more about preventing frozen pipes at the Red Cross's website. The North Shore Health Department received notification about our Chapter 140 Review from Wisconsin DHS. The Wisconsin DHS evaluates operations of all 88 local health departments in Wisconsin at a minimum of every five years, establishing departments as level I, II or III. A level III department meets the maximum requirements established for local health departments, including providing a minimum of 14 programs and services beyond those required by State Statutes. We're receiving numerous reports of nausea, vomiting and diarrhea. CDC, public health and regulatory officials in several states, Canada, and the U.S. Food and Drug Administration (FDA) are investigating a multistate outbreak of E. coli infections linked to romaine lettuce. 6,500,966 pounds of raw beef products may be contaminated with Salmonella. Consumers with questions regarding the recall can contact the JBS USA Consumer Hotline at (800)-727-2333. 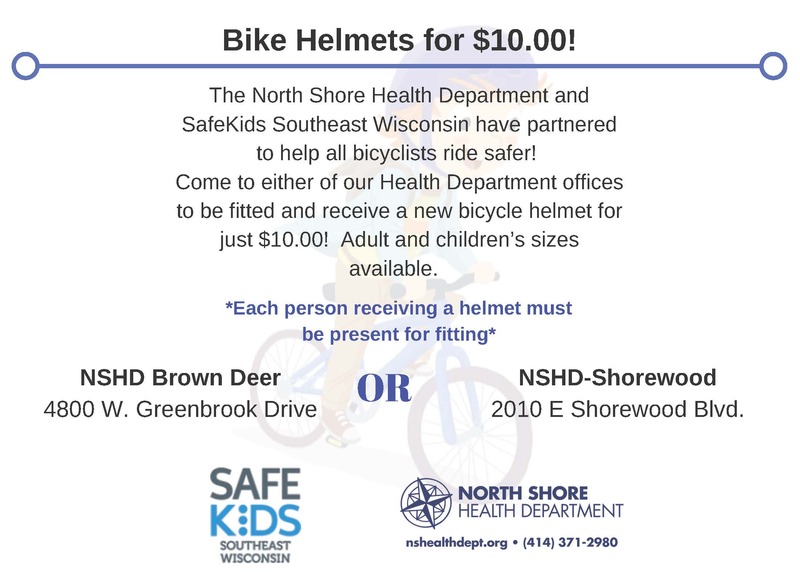 Bike Helmets Available for $10! to help all bicyclists ride safer! The Department of Health Services (DHS) today announced a collaborative effort with Walgreens to provide free rapid HIV testing for anyone 18 years of age or older, with or without health insurance, at five Walgreens pharmacies in Milwaukee. Find out more about the importance of getting tested for HIV at GetTestedMKE.com. Check out the Lead Poisoning Prevention toolkit that the health department created at Protecting Our Kids From Lead. 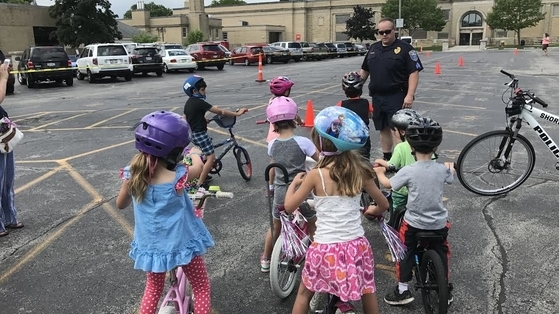 In partnership with the communities we serve, the North Shore Health Department assures, promotes, and protects the health and safety of the people in the North Shore. If you have an urgent public heath need during non-office hours, please call the Bayside Communications Center's non-emergency number at (414) 351-9900 and the appropriate public health authorities will be notified.